Convert AVI MPEG to MKV, and convert MKV to among all popular video formats: AVI, MPG, XVID, H264, MOV, QT, etc. EZuse MKV converter is not only able to convert video files in all formats into MKV but also convert MKV video files into all popular formats. For example, you can convert MKV to 3GP video format or convert mkv to dvd format. 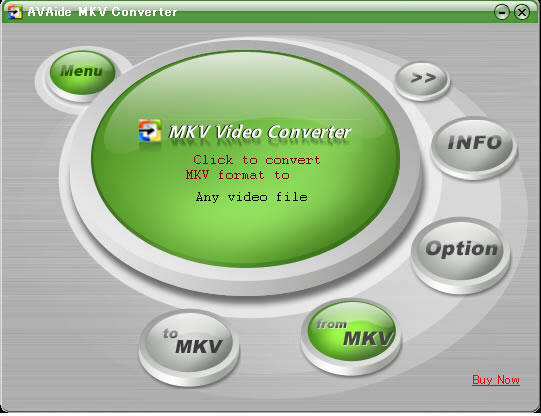 EZuse MKV converter can do all video conversions from or to MKV. While the image quality is high, the conversion speed is very fast (up to 600%). With the integrated video player, you can convert only the outstanding part of the video by setting up the start time and end time after preview. When you need to convert video files but have to leave the computer, there is no worry about this because EZuse MKV converters auto shutdown function will automatically shut down your computer when the conversion is complete. With EZuse MKV converter's cute and easy-to-use interface, you will have a good mood when you are at work. You can quickly master it without any previous study. Download and try it now, the best choice youve ever had. Convert among all popular video formats: AVI, MPG, XVID, H264, MOV, QT, WMV, ASF, FLV, DAT, VOB, RMVB, RM, MP4, MKV, OGM and other popular video formats are supported by the software. Convert a segment of the movie you wanted by appointing specifies start and end position. EZuse MKV Converter can convert AVI MPEG to MKV, and convert MKV to among all popular video formats: AVI, MPG, XVID, H264, MOV, QT, etc. ConvertXtoDVD - convert video to DVD. Watch your Avi, Xvid, Mov, Mpeg4, WMV, VOB, Mpeg, mkv, real, rmvb, and media center files on your home DVD player. Crazi Video for PSP - Supported input format: 3GP, 3G2, ASF, AVI, DAT, DivX, DV, IVF, MOV, QT, MKV, MP4, MPEG, OGM, RM, RAM, VOB, WMV, XivD. Allok Video to 3GP Converter - convert almost all video format, e.g. DivX, XviD, AVI, WMV, MPG, MPEG, MP4, M4V, FLV, 3GP, ASF, RM, RMVB, MOV, MOD, ASX, MKV, OGM, SVCD, VCD, VOB to 3GP, 3GP2, MP4, AVI Video format. Ultra iPod Movie Converter - Convert DivX, XviD, AVI, WMV, MPG, MPEG, MP4, M4V, FLV, 3GP, ASF, RM, RMVB, MOV, MOD,ASX, MKV, OGM, SVCD, VCD, VOB to iPod Movie, Apple TV Video formats and iPod MP3, M4A audio formats. Ultra MP4 Video Converter - convert DivX, XviD, AVI, WMV, MPG, MPEG, MP4, M4V, FLV, 3GP, ASF, RM, RMVB, MOV, MOD,ASX, MKV, OGM, SVCD, VCD, VOB to MPEG-4 formats.